The shoulder brace improves posture without restricting the freedom of movement. It Pulls shoulders back to align clavicle and provide posture support. Use the brace at first as a mild support, then gradually increased tension as you become accustomed to it. Soft and skin friendly padding for increased comfort. Easy to wear backpack style construction with Velcro fasteners for best fit. 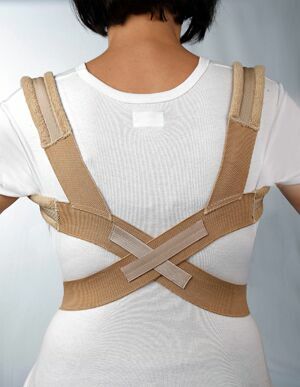 For clavicle fractures, sprains, shoulder instability and posture support.